de Abril. This four-week party consumes every Sevillano's life, but even if you don’t visit in April, there’s more than enough to do here. The city is home to the third biggest cathedral in the world, the Seville Cathedral. Seville's sports, including bullfights and two futbol teams, are a highlight, as are flamenco shows and restaurants where dinners go on from 9pm to after midnight. Wandering the streets of Barrio Santa Cruz is an amazing experience; let yourself get lost amidst the azulejo tiles and omnipresent mini-plazas. Eating, drinking, socializing, and dancing are all some the favorite pastimes here, and the partying goes until after dawn at Seville’s great discotecas or bars on Calle Betis or in the Hercules. Hotels centered around lush courtyards or with wrought iron balconies make for a romantic stay, but city center business hotels and B&Bs round out the large number of options. (Holy Week) and Easter. Summers are swelteringly hot in most areas (97, or 36, in Seville) though the coast and the highlands are a bit more tolerable. Winters are cooler and wet with snow dusting the Sierra Nevada and rain hitting the Sierra de Grazalema; however, other parts of the province are more temperate, and it’s not unusual to see sunbathers and people swimming in the sea in February. Are you here in Seville and you want to see and know more about Andalusia? I have a van and I could drive you wherever you want to go. If you are a group of 4 or 5 friends who want to travel without depending on bus or train timetables, here is the chance! food. Great culture. Very easy to get around. The lovely student town with a great heritage of history and culture! Don't miss it! One of my very favorite cities not only in Spain but all of Europe. Seville has it all; a fantastic "Old Town" the jaw-dropping Alcazar Palace, a beautiful cathedral (the second largest in Europe) - wonderful little restaurants, cafes and a spirited night life. In April they has their annual "April Farias" which is a week of very colorful parades, festivity, food and drink. Almost impossible to get a place to stay unless booked way in advance, many travelers just crash in sleeping bags outside, which I did. A fantastic place! Seville is beautiful and quaint and it's easy to walk almost everywhere. There's lots of sights to see including the can't-miss Alcazar of Seville. A few days here is relaxing, but it's easy to fill your days seeing wonderful sights. There's lots of university students studying here and lots of exchange students too. While the city is historic, it's youthful too. We came in the hot heat of August, and while there's less crowds, the city mostly shuts down. 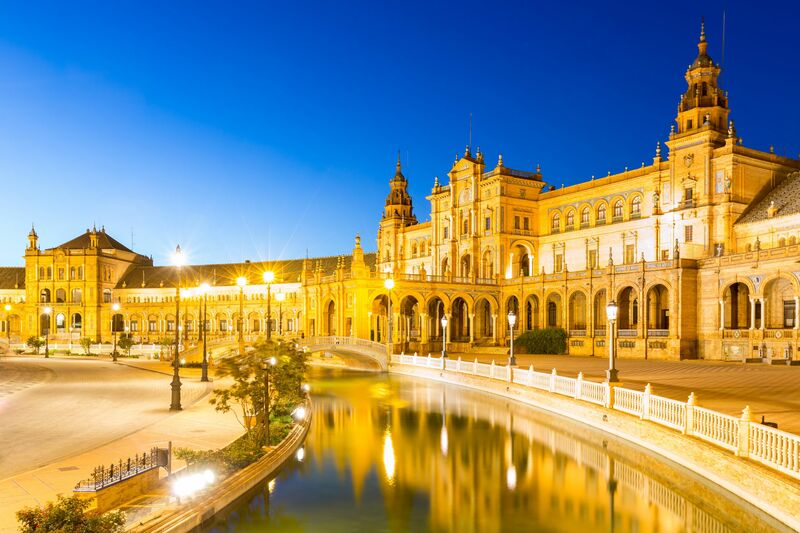 Seville has something for everyone, between its incredible history amazing food and impressive sights. The historic city center is largely closed to traffic, which makes it very walkable. Don't miss the largest gothic cathedral in the world or the amazing Alcazar.